The bear market rally for S&P 500 ETF called Spiders appears to be ending between two key technical levels. Time to book profits. The S&P 500 is traded using the exchange-traded fund called SPDR S&P ETF Trust (SPY - Get Report) , which active traders call "Spiders." We know that Spiders declined into bear market territory from their all-time intraday high of $293.94 set on Sept. 21 to their Dec. 26 low of $233.76, down 20.4% marking the bear market. From this low, the Spiders ETF is up 16.7%, and strength up to the 200-day simple moving average at $273.97 is an opportunity to reduce holdings. The accelerating decline into Dec. 26 was fueled by forced selling, not panic selling. 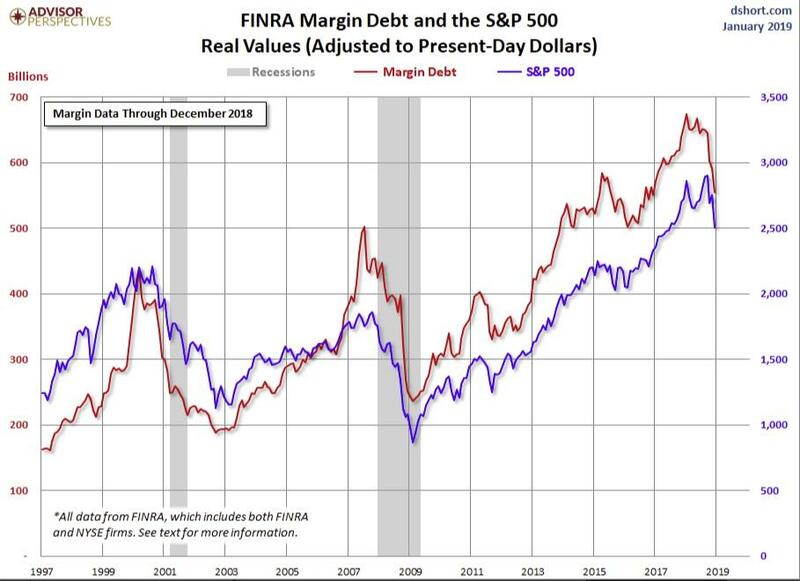 FINRA reported that margin debt declined significantly in the fourth quarter. My eye-ball estimate indicates that investors had to raise $50 billion to $60 billion in the fourth quarter to meet margin calls. When Spiders traded as low as $233.76 on Dec. 26 the ETF turned on a dime. This was a test of its 200-week simple moving average or "reversion to the mean," which was a buying opportunity. With the close of $246.18 on Dec. 26 above the high of Dec. 24 at $240.83, Dec. 26 was a classic "key reversal" that prompted my theme that a bear market rally was underway. The 2019 high of $273.44 was set on Feb. 5 between two key technical levels suggesting profit-taking. SPY was between a Fibonacci Retracement level of $270.96 and its "reversion to the mean" at $273.92. This strategy remains in play and could mark the end of the bear market rally. As the bear market decline was underway, Spiders confirmed a "death cross" on Dec. 7 when the 50-day simple moving average declined below the 200-day SMA, indicating that lower prices would follow. This tracked the ETF to its Dec. 26 low of $233.76 and that "key reversal" day. When under a "death cross" the strategy is to reduce holdings on strength to the 200-day SMA now at $273.96. The close of $249.92 on Dec. 31 resulted in three horizontal lines. My semiannual pivot is $266.14 with my annual and quarterly risky levels at $285.86 and $292.16, respectively. The close of $269.93 on Jan. 31 resulted in the horizontal line at $177.88, which is my risky level for February. The Spiders ETF popped above its semiannual pivot at $266.14 on Jan. 30 following the dovish news from the FOMC meeting. The weekly chart for Spiders has been positive since the week of Jan. 18 and the ETF is above its five-week modified moving average at $264.87. 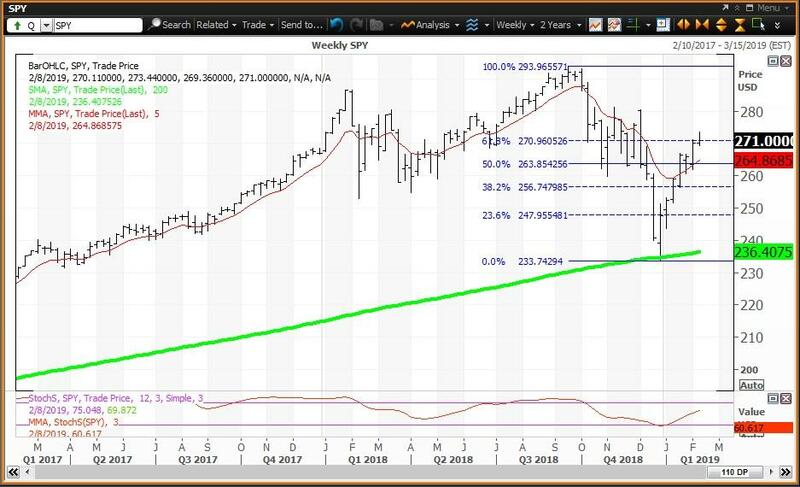 SPY is now well above its 200-week simple moving average or "reversion to the mean" at $236.41, after this average held at $234.71 during the week of Dec. 28. The 12x3x3 weekly slow stochastic reading is projected to end this week rising to 60.61, up from 53.40 on Feb. 2. 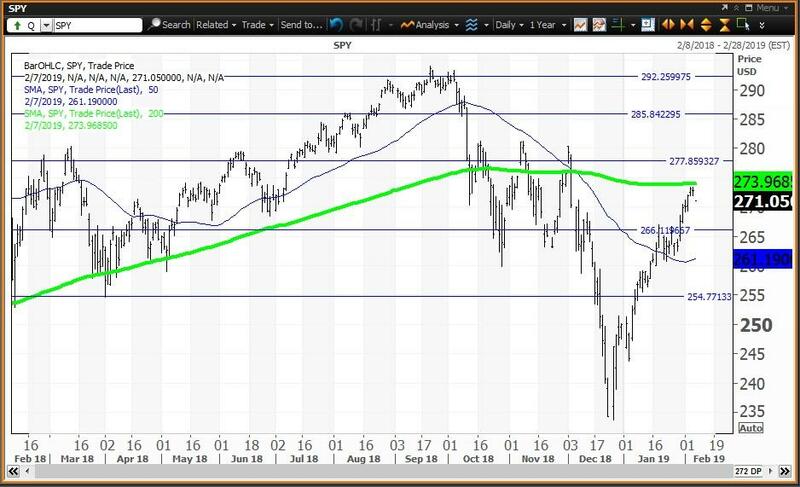 The horizontal lines are the Fibonacci Retracement levels of the 20.4% bear market decline from the Sept. 21 all-time intraday high of $293.94 down to the Dec. 26 intraday low of $233.76. Note that this week's high of $273.44 was above the 61.8% retracement level at $270.96. Trading Strategy: Reduce holdings and book profits between the 61.8% retracement at $270.96 and its 200-day simple moving average at $273.96. The initial downside risk is to my semiannual pivot at $266.14.